Bananas are considered by many nutrition experts to be a perfect food. They are nutrient-rich and an excellent source of many essential nutrients. You might be surprised to learn that there are 30 different varieties of bananas in existence! North Americans are mainly familiar with the tapered-end variety. This article is about another variety, the dwarf, or “baby” banana, a nutritious, tasty, but lesser known tropical fruit. Baby Bananas has 217 Calories and 3.33 g of Protein per 100 gram serving according to the nutrition facts provided by the USDA Food Composition Database. North Americans are mainly familiar with three types of bananas. Two of them are sweet: the Cavendish (blunt-ended) and the Gros Michel (with tapered ends). The third commonly known variety is the plantain, which is not sweet and is much more like a starchy vegetable than a fruit. It is mainly cooked and served as a starchy vegetable. North Americans are much less familiar with the baby banana, though it is available regularly in most supermarkets and is sweet and small. Baby bananas are tropical fruits, a cousin of the other varieties of bananas, and are grown in very humid climates, especially parts of the Caribbean, Latin America and Mexico. There are smaller baby banana crops in California and Florida. These fruits are available year-round. They come about four to six fruits to a bunch and are often referred to as "fingers" of the bunch. These versatile fruits can be eaten raw or served as a dessert with sugar and cream, or juice. They can be roasted, fried or boiled. Baby bananas are best served out of hand, raw or sliced in fruit salads. The species name for the baby banana is pisang susa. It is yellow and measures 3 to 4 inches long. It is the sweetest of the banana family. A mild fruit, it almost has an apple-like flavor. Exoticland Fruits Ltd., an importer of this fruit, describes them as small, crunchy specialty bananas. They look like a mini-version of the tapered-end banana. The peel is smooth and easily separated, or peeled back, from the edible pulp when the fruit is ripe. Baby bananas are low in calories, and an excellent source of certain nutrients, much like standard bananas. They offer approximately 100 calories per 100-gram serving, 1/2 g of dietary fiber, a trace amount of fat and 27.2 g of carbohydrates. They are an excellent food source of vitamin A, offering 200 International Units (I.U. ), or approximately 23 percent of the Recommended Daily Value (DV) for this vitamin. They are a good food source of vitamin C, offering 10 mg per 100 g, or nearly 15 percent of the DV for this nutrient. All bananas are rich in the mineral potassium. Like other yellow bananas, the peel of a baby banana will turn from green to yellow when ripe. As with other fruits, select them according to when they will be eaten. The sweet flavor is enhanced as it ripens and develops more brown spots. 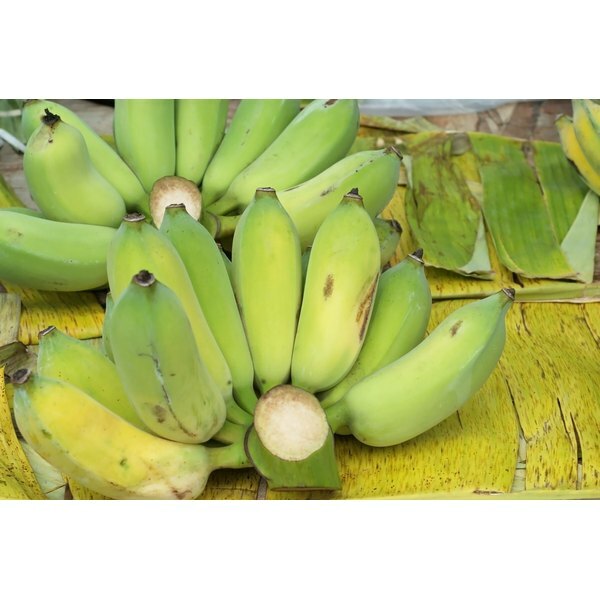 As with other varieties of sweet bananas, baby bananas are brown when overripe and green when not yet ripe. Placing bananas in a fruit bowl in the sun will hasten ripening.